Here's a hint: it's black and yellow. Here's another: you wear it. 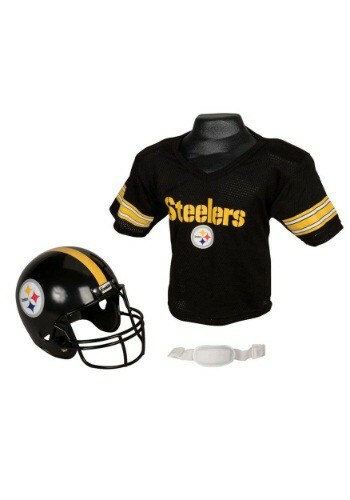 That's right, our officially licensed Child NFL Pittsburgh Steelers Helmet and Jersey Set will have little guys all over your abode calling out audibles and dividing the home into a field, sides, and endzones. If you're a diehard fan of the black and yellow, maybe he'll let you play too! Suit him up for duty in the steel city with this fun NFL set. He might be a few years from leading the next generation of the Steelers to a Super Bowl victory, but this set paired with a Terrible Towel might be a good stepping stone from gridiron fantasies to gridiron legend.